Each work of art has at least one story to tell. Dorothy and the Tin Man peek out from behind a giant beanstalk. Little Red Riding Hood watches as Raven steals the sun. John Henry distracts Goldilocks from the three bears. Meanwhile, a giant squid attacks Captain Nemo's submarine. 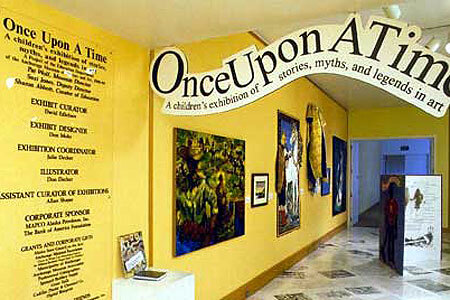 This was the setting for "Once Upon a Time: A Children's Exhibition of Stories, Myths and Legends in Art" at the Anchorage Museum of History and Art. Each year the Museum hosts a yearlong exhibition for children and their families. They have done so for the past sixteen years. As co-curator and educator for the exhibitions, it is my job to be a storyteller -- to take a theme and bring it to life for a young audience. 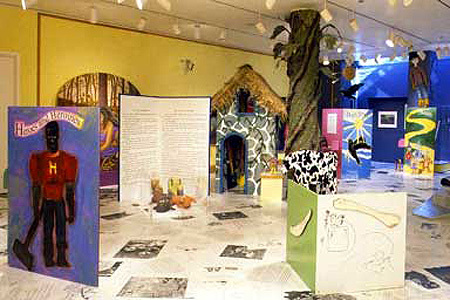 Exhibition themes have included maps, artist boxes, artists' books, computer art, masks, the Middle Ages, fashion, and more. "Squish:The Art of Printmaking" is the current exhibit, and the 2001-2002 exhibition will be all about bugs. Every element in the 5,000 square feet that make up the Museum's children's gallery becomes part of the storyline that takes visitors on a tour of an imaginary world. Walls of the gallery are transformed into forests or the walls of ancient castles. Children can climb on moon crawlers, steamrollers, submarines, and trains. The giant column in the center of the main gallery challenges our creativity each year. We stare at it and ask ourselves, "What can it be this year?" Over the years, exhibition designer Don Mohr has transformed it into a giant ink tube, volcano, beanstalk, castle turret, and circus carousel. Even the floor of the gallery changes from year to year to fit the theme. In "Once Upon a Time," giant pages from classic storybooks became floor tiles -- a living book for children to read while they walked. The idea behind the exhibition program is to teach children about key concepts in contemporary art. The exhibits are enhanced by eight weeks of summer workshops and a full year of art classes taught by artists from the Anchorage community. Throughout the year, 15,000 children from the Anchorage School District will tour the exhibition with their classroom teachers. More than 200,000 tourists visit the Museum each year as well. As educator for the program, I work to broaden the educational possibilities of each exhibition and relate the art to other subjects. The best way to do this is through stories. I tell stories about the art and the artists and I ask children to create their own stories. The artists tell stories through their artwork, whether deeply personal or familiar to everyone -- like Goldilocks and the Three Bears. Some of the stories the artists tell are about famous people, places, and events. Children discover the stories in the art by learning to look carefully and by answering questions asked of them in the labels around the artwork and in the exhibition catalogue. In every exhibit, artwork is included from many different cultures. The artwork may tell stories about how things began, or pay tribute to heroes and heroines. Some artworks take viewers on great quests and journeys, to places real or imagined. Other artworks are illustrations of fantastic beasts; others are of everyday animals. In finding the stories in the artwork, there are no wrong answers. When a child imagines a story, the artwork has come alive. I feel I have been successful as an educator when a child takes over the role of storyteller and finds his or her own ideas and ways of looking at art. The idea is not to create young artists, but to expand the possibilities and the imagination of the child. Art encourages new ways of thinking and new skills for creativity. I want children to do more than drag their feet around the exhibition each year. I want them to giggle and climb, and to beg their parents or teachers to let them stay just a few minutes more. I want them to learn in a way that encourages all learning styles and levels of development. I want them to find more in the artwork than just a two-dimensional painting on the wall. I want them to love to look, and to enjoy the discoveries looking can bring. I want them not just to imagine the creatures or the places the artwork suggests, but also to invent their own fantastic creatures in their own mythical lands. I want to see them scribble and paint and print and cut and dream of what they would do if they were invited to hang their own artwork on the wall. I want them to escape from the place they came from and pretend they are in a whole new world where they are leaders of a safari, explorers on an expedition, knights on a quest, or captains of a submarine setting out on a long and undetermined voyage. If we are lucky, they will tell us their stories, inform us of their adventures, and teach us about their discoveries when they return. 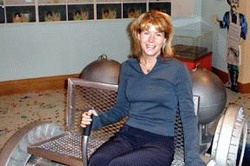 About the Author: Julie Decker grew up in Anchorage, Alaska, and is the director of the Arts in Education program for the Alaska State Council on the Arts; a co-owner and manager (along with her father, Don Decker) of the Decker/Morris Gallery, and a co-director of the International Gallery of Contemporary Art. She is also co-curator for the annual children's exhibitions at the Anchorage Museum of History and Art, developing all educational materials for the yearlong exhibitions. Decker is the author of Icebreakers: Alaska's Most Innovative Artists, a guide to the last 25 years of contemporary art production in Alaska. She is currently at work on two books, Found and Assembled in Alaska, featuring Alaskan artists who work with found objects in their sculpture, and a biographical and pictorial retrospective of the life and work of Aleut sculptor John Hoover.